Description: this larger T-Rex figure measures some 25 centimetres in length and stands just over 15 centimetres tall. This Rex sculpts stands in an attack posture, with its tail bent upwards and its head slightly tilted up. Its legs stand far apart from each other. This Rex is pretty skinny and has little body mass. It’s mostly head, limbs and tail. A very large dino damage would is found on its right flank, showing white ribs and red muscle tissue. The upper piece of exposed rib is actually a button which activates a shrieking roar, as if the creature is in pain. A second roar, more aggressive and imposing, can be made by pulling its right arm down: when doing so the mouth will also open. A third sound, the stomping noise, can be made by having the T-Rex stomp on the ground. The sound quality of all three sounds is not very good, some static is heard as well. This (Ultra) T-Rex sports a darker paint job than its previous incarnations. Except for its underside (throat, belly and lower part of the tail), which is coloured light grey, all of its body is painted dark grey. The darkest parts of grey are found on the head and back, while the tail and limbs are of a slightly lighter shade of grey. Red stripes run from the neck over the back to the end of the tail, while there are also a few of them on the upper legs. The stripes on the back are more pronounced because the torso section of this sculpt is composed of harder material. The claws on both hands and feet are painted very light grey, almost white. The Tyrannosaurus has a pink tongue and inside of its mouth, as well as small red eyes with black pupils. It carries a white JP logo on each upper leg. Analysis: the not so impressive Tyrant King of Hasbro returns a third time to do a quick cash grab from kids and collectors alike! At least this time the paint job is totally different, instead of a pale copy of the original JP III Rex like the JPD2 release featured (though it's also not nearly as ingenious or appealing as the Camo-Xtreme Canyon T-Rex's paint scheme). A darker and grittier colour scheme is found on this T-Rex, hinting at its status as a terrifying large carnivore with big nasty pointy teeth. The combination of dark grey (almost black even) and red stripes also makes it look a bit like a possible Camo-Xtreme Lava T-Rex. It's a good paint job, but also a bit too simple: just dark grey with a few small red stripes and a light grey underside. For such a big sculpt, more detailing would have been appreciated. Aside from the new paint job, this Rex is otherwise no improvement over its JPD2 predecessor. It's still a big but skinny creature standing in an awkward posture that hinders playability, with an unimaginative and ineffective attack feature, and the same old sounds of crappy quality with weak electronics to support them. It still features silly stomping sounds which can only be activated by bashing the figure's feet to the ground, only speeding up the process of the electronics inside dying an all to quick death. Even though JPD3 is a fairly recent toy line, it's quite common for MIB samples to be unable to produce sounds, and it ain't just the batteries being dead. Overall, the new paint job is the only potential worthwhile thing in this set. Repaint: yes. 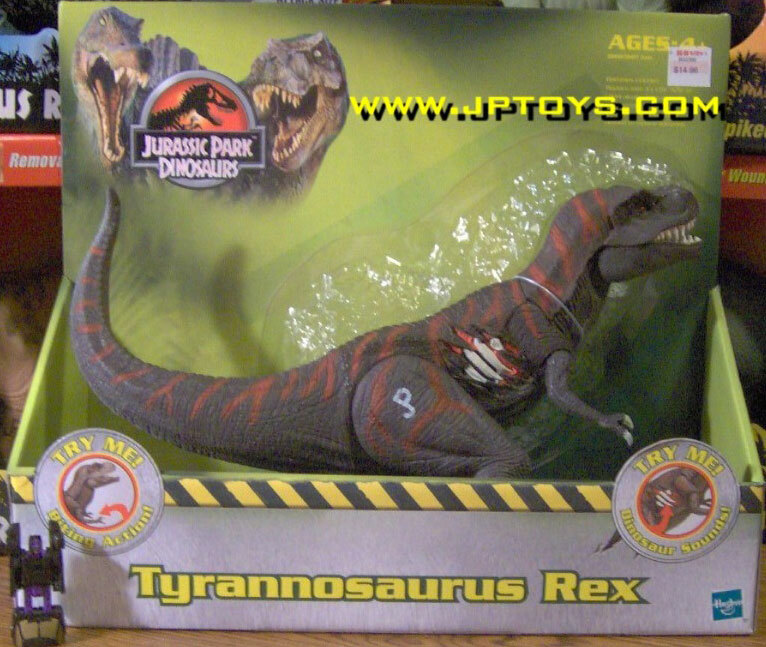 This is a repaint of the JP III Ultra T-Rex figure. The sculpt has been repainted before for Camo-Xtreme and JPD2. Overall rating: 5/10. A different and dark paint job for this T-Rex, which suits it well but is a bit bland. The sculpt itself still is quite disappointing for a big figure. Like the other big JPD2/3 electronic dinosaurs, this figure was common a few years back, but, in terms of availability, its numbers are in swift decline. You might still get one for a decent price now, but don't expect this situation to last much longer.